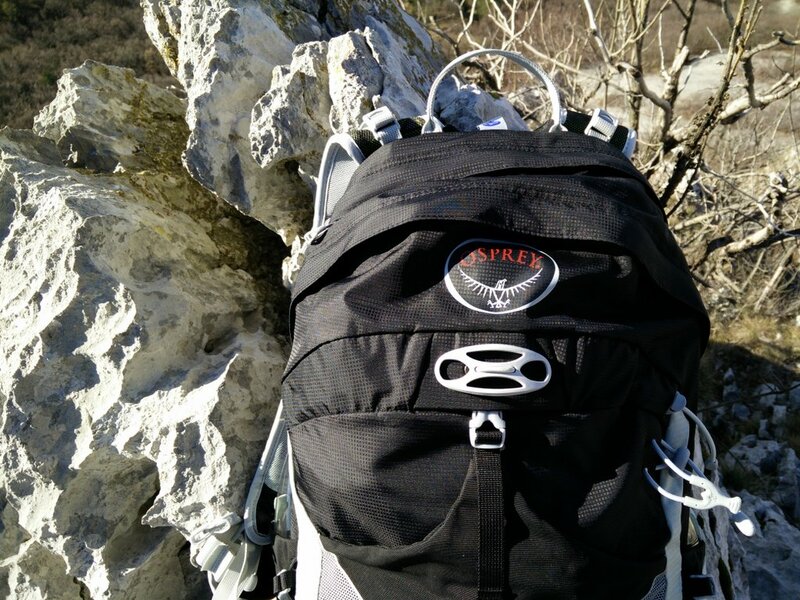 When it comes to short hiking trips, a daypack is one of the most useful pieces of hiking gear as it allows you to easily and comfortably carry additional clothing, water, food and accessories. 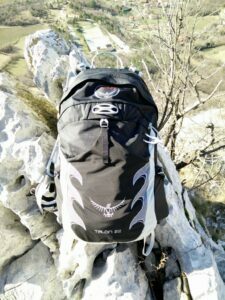 Many hikers use relatively big backpacks (+ 40l) also for short trips, but this is not efficient as these backpacks do not provide sufficient stability when not loaded appropriately (the items in the backpack move around thus decreasing the stability). 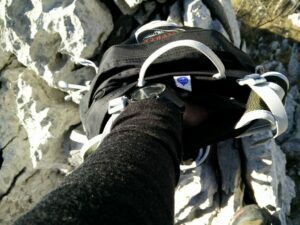 After I concluded my “Hiking Iceland” tour and started training for hiking in the Alps, I decided to conduct a short via ferrata trip for which I needed a lightweight daypack. 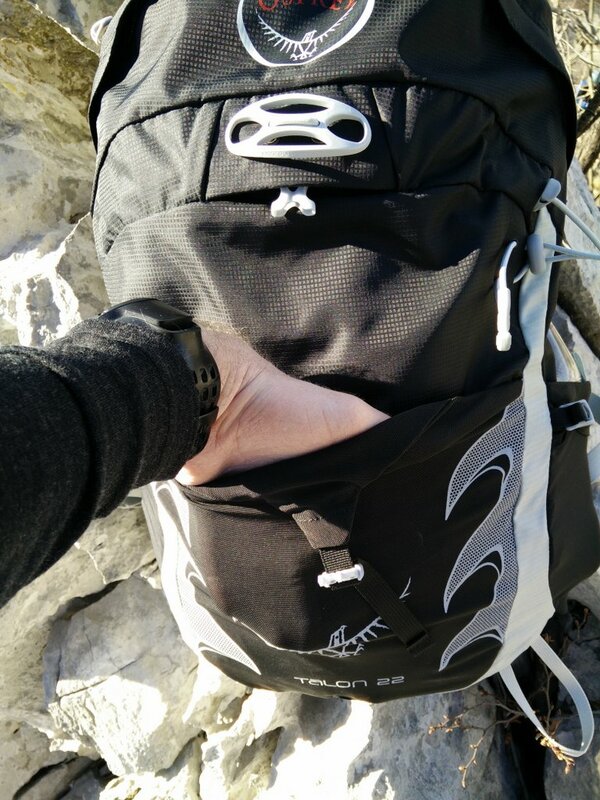 As I was very satisfied with the performance of Osprey Talon 44 backpack which I was using in Iceland, I decided to purchase the Osprey Talon 22 daypack. 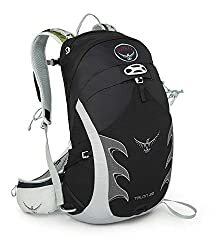 The Osprey Talon 22 is currently one of the most popular daypacks among hikers, mountaineers and trekkers as it is extremely light, comfortable and offers superb functionality. 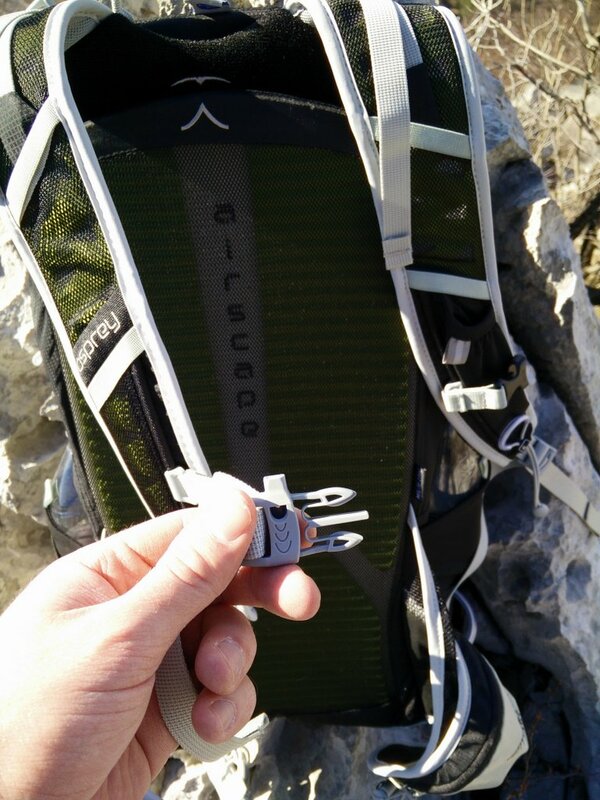 I thoroughly tested the Osprey Talon 22 on the via ferrata trip and here is what I learned. 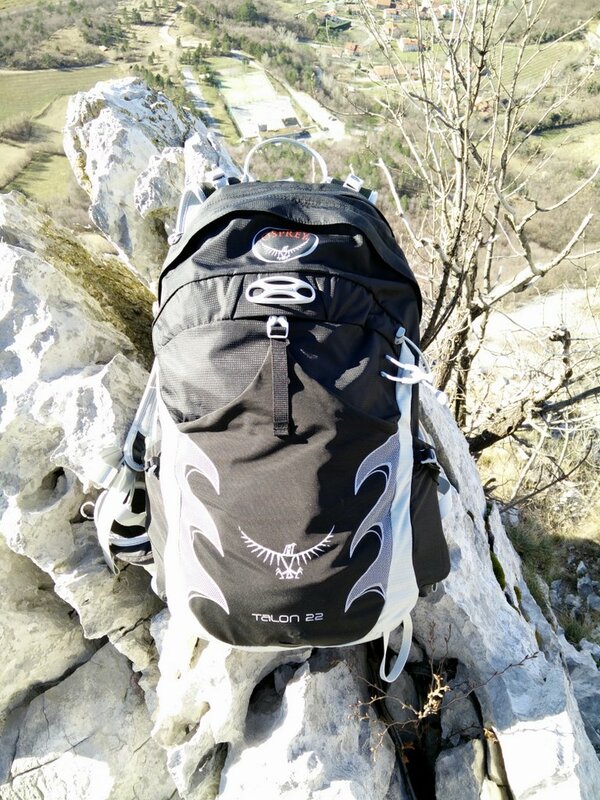 The Osprey Talon 22 is designed to be extremely light (it weighs merely 750 g) and is made of very light nylon which is reinforced at the bottom and sides for increased durability. The hip belt and shoulder straps are made of mesh-covered foam to reduce the burden of the daypack on your shoulders. The front stash pocket is also made of light-weight mesh. Due to the foam/mesh construction, the hip belt and shoulder straps also offer great breathability. The slightly curved backpanel is made of relatively thick ergonomically shaped foam and also covered with a durable mesh fabric. The mesh fabric is smooth and soft to the touch and doesn’t cause any abrasion when it’s rubbing against your clothes. 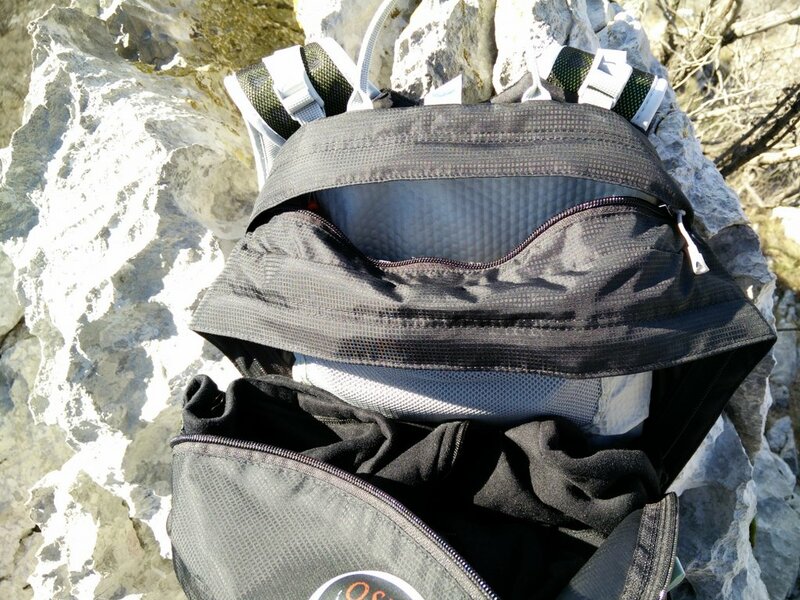 It is seen that the manufacturer tried to strip any excess weight off the daypack but in a way that doesn’t influence the durability or functionality of the Osprey Talon 22. The Osprey Talon 22 offers great comfort and adjustability. The AirScape backpanel is slightly curved and thus creates a small gap between the backpack and your back. This allows the air to flow in-between and reduces additional sweating. In addition to that the backpanel offers great stability. The shoulder straps and hip belt are not only comfortable but also well-ventilated as they are made of mesh covered foam. The length of shoulder straps and hip belt is fully adjustable. The hip belt can be tightened by pulling the straps inwards which is much more handy than pulling the straps outwards. The shoulder harness is attached to the backpanel with a strong and reliable Velcro system and can easily be adjusted in length to fit everybody. In addition to that you can also adjust the distance between the shoulder harness and the top of the backpack with two convenient straps. The only remark that I have is that the shoulder straps are relatively narrow and might cause some discomfort when carrying a very heavy load. 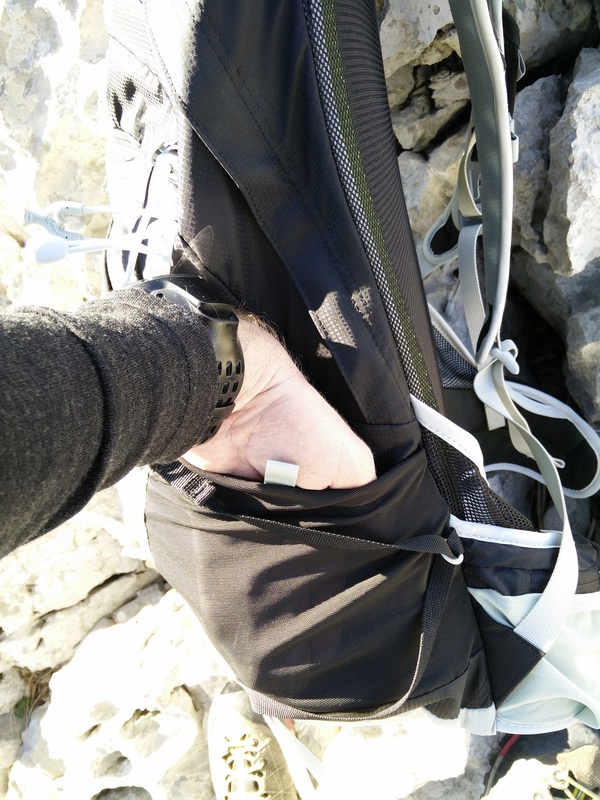 However, on my trip I was carrying quite some gear in the daypack (climbing harness, via ferrata set, water, food, additional clothing) and I didn’t notice any pain because of the more narrow shoulder straps. The Osprey Talon 22 is equipped with a main compartment, inner zippered pocket, top zippered pocket, two zippered hip belt pockets, two mesh side pockets, shoulder strap pocket, front stash pocket and external hydration sleeve. The main compartment is accessible from the top through a double zipper and offers enough space for storing equipment for one day hiking trips. On my hike I was carrying a Softshell jacket, thermal underwear, climbing harness, via ferrata set, water and food in the main compartment and everything fitted in easily. There is also a zippered pocket inside the main compartment which is meant for storing valuables. It is placed relatively high and thus allows easy access even when the backpack is fully loaded. Just behind the main compartment zipper, there is another zippered pocket which is big enough for storing accessories such as for example sunglasses, gloves and a hat. In the pocket there is also a key attachment clip. 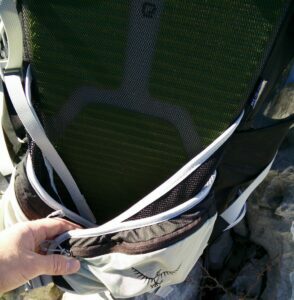 The hip belt pockets are really well-placed and allow easy access without taking the backpack off. They are big enough for storing a GPS device, camera or even a 5.5-inch Smartphone. 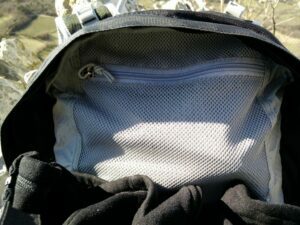 The side mesh pockets are designed for storing water bottles. The shoulder strap pocket is relatively small and placed on the left shoulder strap. It can be used for storing powerbars or even a small (old) cell phone. The front stash pocket is meant for storing wet clothes and other gear that you don’t want to put directly in the main compartment. I found it very useful as it allows you to quickly store the gear that you don’t need at the time. It can be accessed without taking the backpack off. The external hydration sleeve is placed between the backpanel and the main compartment and fits hydration reservoirs with a volume of up to 3 liters. 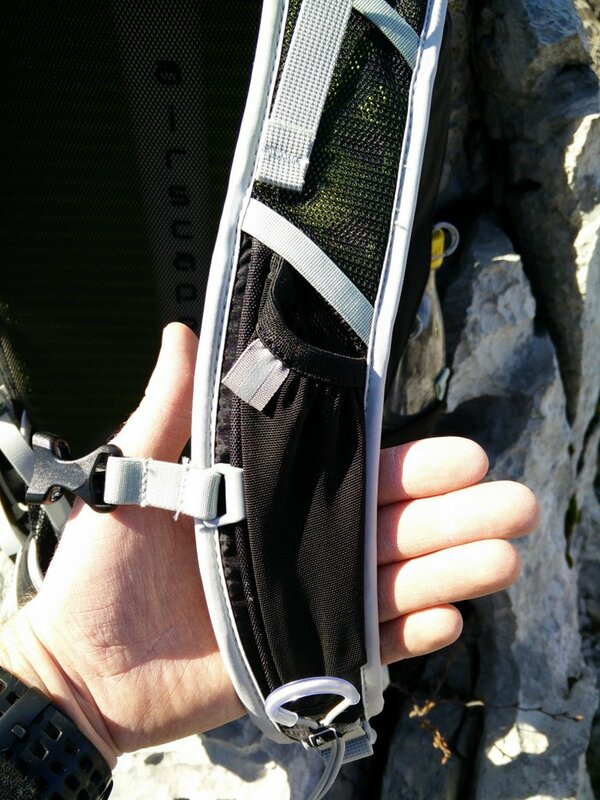 As the hydration sleeve is not placed in the main compartment (as in most competitive daypacks) it allows you to easily refill the water reservoir without emptying the backpack first. The Osprey Talon 22 is equipped with the Stow-On-The-Go hiking pole attachment system, ice tool holder, LidLock helmet attachment point and LED light attachment point. The hiking pole attachment system allows you to easily attach or detach hiking poles without having to take the backpack off. This system comes in extremely handy (especially when doing via ferrata trips) and I was very satisfied with it. The LidLock helmet attachment point is designed for biking helmets but I didn’t have any problems attaching my climbing helmet to it– I just slid the plastic through the ventilation hole and my helmet stayed securely attached throughout the hike. I haven’t yet tested the ice tool holder or LED light attachment point (primarily meant for bikers) but they seem durable and well-designed. On the chest strap there is also a discreet emergency whistle which can come in handy if things go wrong. 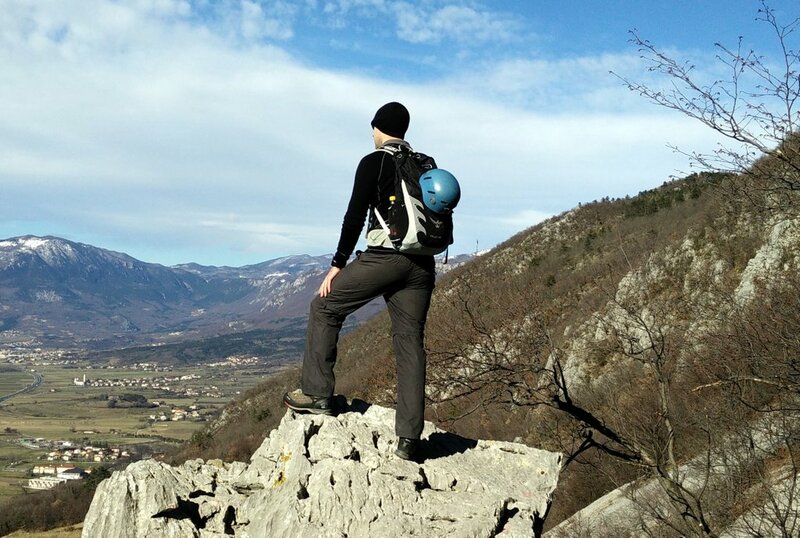 I used the daypack on the Gradiska Tura trail and I can’t say a single bad thing about it. 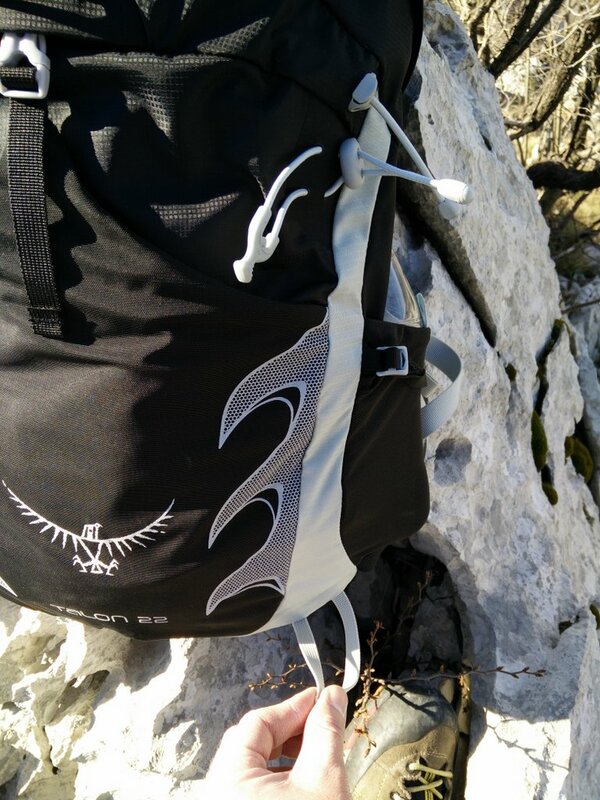 The Osprey Talon 22 is light, comfortable and extremely functional. I was especially satisfied with the well-placed pockets, Stow-On-The-Go hiking pole attachment system and LidLock helmet attachment point. 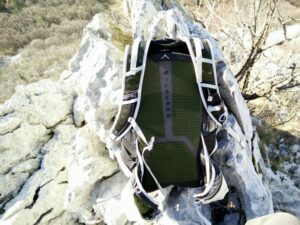 I would recommend this product to everybody who needs a high-quality daypack for one day hiking trips. 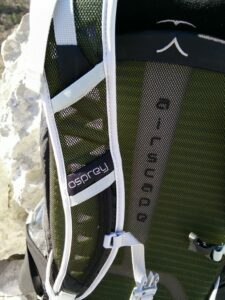 Note: In early 2017 Osprey released a new version of the Talon 22 daypack. The daypack now features an improved backpanel and hip belt.